Beacon is a connected platform that starts w/ sourcing but also does monitoring, context, diligence, syndication and most importantly, per Chris, portfolio support. It’s a data platform that looks like a Bloomberg terminal for the startup industry. They started building it seven years ago and they employ a full-blown engineering team of data scientists and tech engineers. Beacon tracks a vast array of data on 6M different companies. And Chris started with first principles, asking “what are the KPIs that the management teams of these companies are measuring?”… those are the same elements we should measure with Beacon. It analyzes items including customer behavior, frequency, engagement, CLV, consumer transactions, financial flows, quality of those flows, news sentiment and also team construction and quality, just to name a few. And signal fire’s platform isn’t just for the investors. There is a UI for advisors and most importantly founders as well. Founders can utilize heir robust SaaS recruiting platform to address the key need of early-stage companies… recruiting top talent. 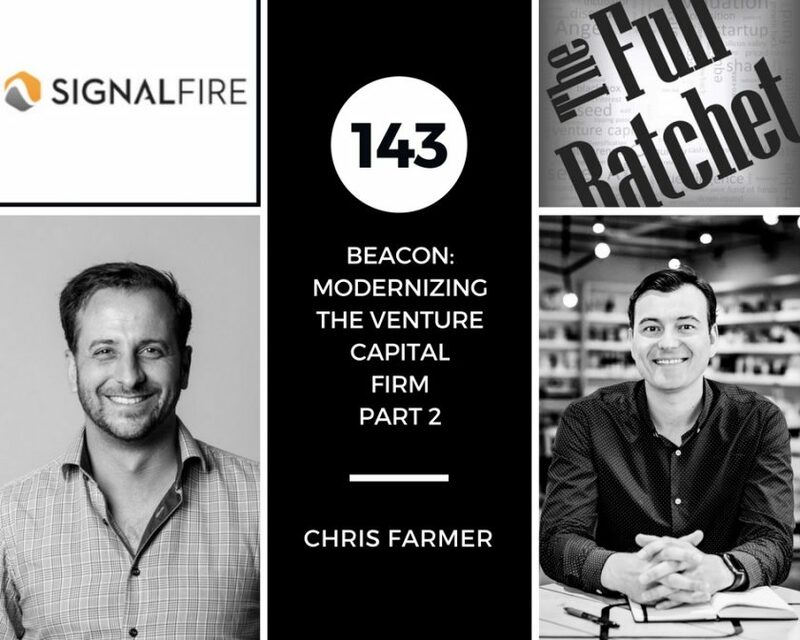 With Beacon, Signal Fire has set out to tech enable the entire value chain of a venture firm from end-to-end. Early indications from folks in my network are that it’s an impressive platform indeed. Signal Fire did not coin the concept of “the prepared mind” but Chris does follow it. The approach that came out of Accel has an emphasis on heavy research on existing domains. The creation of market maps that help visualize the landscape and reveal opportunities. In a previous episode, David Cowan discussed his approach to the Space vertical that leverages this methodology. And in Chris implementation, he is constantly refining the maps. He meets with LP experts and founders to go much deeper and broader than they could do w/ data alone. The result is that Signal Fire is often much less bullish on the en vogue sectors and vice-a-versa. Their investment in pizza making robot company, Zume, certainly illustrates their fresh perspective on an oft-ignored industry. I asked Chris for a common thread that he’s noticed across successful startups. And I really enjoyed his response. The common thread in winners are those companies that are doing things full-stack. They are creating an end-to-end solution that is vertically integrated. Where a company can be its own customer in order to provide a better solution for the end consumer. I discussed this concept w/ Charles Hudson in a previous episode. We talked about finding the place within the vertical supply stack that enforces discipline on the chain and drives the most value. Chris point was compelling in that he looks for startups that own the chain, not just a part of it. Nick: if he had any questions for you. And his question was, #Chris, why is the best way to monetize your extremely impressive platform via venture capital and a venture capital fund and not some other use? Chris: So I got to send some, some #Horsley love. Fantastic partners! They, they anchored our, our first fund and they have been believers from, from the beginning. They, they really themselves have a very sort of data driven quantitative approach to, to understanding venture. A very unique perspective. And there’s a lot of sort of herd mentality particularly in the LP community but more extreme than the venture community because there’s often, you know, dozens of investors that will come in concurrently into a given fund. And so they rely much more on each other. And, and #Horsley has just been the best partner one could ask for. So to their question, we got this question a lot. And the, you know, why aren’t you just an arms dealer to all the other venture firms. And the reality is, you know, we could be but that, you know, when you, when you, when you sell that information to one firm, it’s worth a 100% to them. If you sell it to a second firm, it’s now worth 50% to both of them because they’re both seeing the same thing at the same time. And so on and so forth. And it degrades very rapidly to the point where it’s not of much value to anyone. And so, you know, we could either be a data provider, which is frankly not the most interesting from a monetization standpoint but even more importantly not where our hearts are. I mean, we did this to become better venture capitalists. We didn’t do this to start a startup to serve the very small cottage industry of venture capital. And so almost always if you really have something that’s differentiated from a technology standpoint that is game changing in the approach, you’re, you’re generally better off applying that yourself and becoming #Uber rather than becoming, you know, a dispatch app for, for the taxi companies. And that because it’s, it’s not just, you know, you plug and play into existing infrastructure. You really have to think through everything from the bottom up, from team construction, organizational design, business model and everything else. You can’t just sort of dispatch taxi’s. You have to think about dynamic pricing. You’ve got to think about, you know, demand anticipation because a lot of the drivers let’s say in #Uber are coming from an hour away. So you can’t just, you know, fire it up and, and have them all ready and not sort of think through where demand is going to be in a given day. So you really got to reinvent and think through every process in these full stack startups. And, and we’re no different. And so first off I think we’d be less successful if we were enabling other firms because their architecture was not created thinking through sort of this type of data enablement. But at the other level, you know, it’s, you know, also structurally, you know, if it is truly a competitive advantage, which we’ve obviously bet our careers, if that’s the case then you, you’re better off, you know, bringing that in house and using that to, to really create advantage for you specifically. Nick: Great. And, you know, earlier you mentioned that you do some advisory work with Public and Fortune 100s. So to some degree are you leveraging sort of the, the tools that you’ve built to get some value from other sources? Chris: Yeah, absolutely. And that’s, and we do, we do it only in ways that we think are complementary to our portfolio companies. We turn away probably at least 75% of the work that we’re offered. So we have a dedicated research group that does this work. And we don’t use any company, we have a very strict firewall. 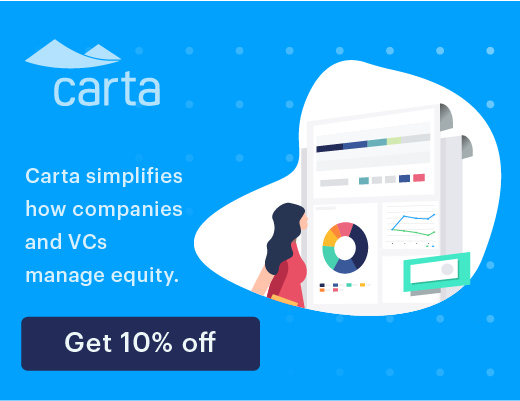 We don’t use any data from the companies or from the venture capital businesses. A 100% generated by the system. So it’s inherently a 100% sort of public domain and, and, and data that, that we are, would have the opportunity to, to, to share. But what it enables us to do is develop, you know, hundreds of corporate relationships that frankly is, is not economic for the venture funds to, to manage on a regular basis. But because it’s a profit center for us, we can easily economically justify it. You know, the only other group out there in the venture industry that is, is managing a sort of similar set of relationships would be like #Andreessen Horowitz, and that, that has this sort of executive briefing center. And so it’s much more along the lines of that. But it’s a dedicated, you know, relationship effort rather than just, you know, sort of a adhoc basis as is true in most venture funds. And so, you know, it, it’s a, it’s a double bottomline for us in that, or actually triple I guess in the sense that we help our clients on the corporate side to be smarter about the domains that they’re, that they’re thinking about, and that helps us to also be smarter about the domains that we’re looking at and the perspectives of what are the most strategic areas that the, that the corporates care about. Which is hugely valuable down the road on the M&A side of things or even as if you’re going to take a company public to know what the sort of corporate strategic interest is in a particular area. And if you don’t have, you know, larger corporates caring much about, you know, certain areas of, of the technology realm, you have to then really take a hard look at that and say are they just slow to figure it out or is this just not that strategic an area where there’s an opportunity to create huge value. It may be technically interesting or challenging but not have enough end application or leverage in it’s application that you’ll have customers that are willing to pay large premiums for your product or ultimately for the company itself. Nick: Sure, sure. I know like in my world, my, my view is much more narrow than yours but I’ve got a lot of peers that have asked me why I spend so much time with Series A firms. And my response is well Series A firms are my customer too. Entrepreneurs are my customer but I also need to understand what, you know, the downstream investors are looking for and what’s interesting to them and what unit economics. Because if I don’t really understand what they’re looking for, it’s, it’s not going to really inform my process and, you know, where I need to be focusing. Chris: Now that makes totally sense. That makes a ton of sense. You know, I, I think you really want to in this industry at all after trying to see around corners if you’re trying to understand where the world is going, you need to be spending time with folks at the Vanguard that are the most sort of out there. And it may start with, you know, hobbyists or, you know, academic research or entrepreneurs that believe the edge of various domains that may start looking a little crazy until the world, you know, starts to come towards their world view. And, you know, certainly early stage investors in the sort of, on the sort of investor side of the spectrum or sort of the, they’re in, in pioneering new markets that are emerging frontiers as opposed to the later stage folks that become increasingly more financial in their orientation of how they see the world, as opposed to really focusing on the sort of technology itself on the trends and the, and, you know, and the demographic changes or structural changes that are happening in the industry. And trying to sort of anticipate where these, these different forces are going to collide and what opportunities that’s going to create downstream. Chris: Yeah. So the genesis of the firm was that, you know, I took a year off after #Bessemer and, and did what I believe became the largest applied study of venture capital ever done, where we interviewed over 500 founders, 170 funds from seed to buyout to hedge and every major venture fund in between, and ran the numbers on over 20,000 companies and thousands and thousands of founders, etc. and sort of to really understand what were the key leverages of the business. And during that process, when I interviewed all those founders, I always asked, you know, who were the most valuable advisors that you had, who would you most first turn to for capital if you get anyone on board your company? Chris: Who would it be? And we created a massive list of these people. And then did it over and over and over again to the point where, you know, it became pretty clear who, who were some of the most thoughtful connected, you know, advisors with the sort of most unique perspectives that, that would also create bandwidth to, to really impact a company. And, and to a degree some of this evolves, you know, they come in and out of companies and they have more or less bandwidth over time. And so we try to be cognizant of that. But we then systematically started pursuing these folks. And when we raised the original money of our $5M for the company, we did it in, you know, $100,000 painful chunks or less, and in order to get the right people involved. And so we tried to be as thoughtful about building our base of, of advisors and LPs as, as we proposed that our startups do themselves. And we always look at them as an extension of the firm, an extension of the team, and we put no less effort into finding the best people for our advisor network than we do for, for direct hiring onto the team itself. Nick: Any characteristics or, or trends that emerged across all these advisors? You know, after you did the study? Chris: We went specifically for a heterogeneous mix as well. And so we basically graft Silicon Valley and wanted to have a central note in every cluster of the Valley. And so, you know, I think you want heterogeneity as well on behalf of your founders. So you want someone who’s an expert on almost every area of the technical stack. You want someone who is, you know, sort of a demonstrated, you know, leader in whatever the domain. And that, and, and that domain may range from we’re, we’re heavy product and engineering, probably 25 of the top CTOs in the Valley, but we also have all sorts of different functions like general counsels, corporate development, m&a, design, PR, and sort of every sub domain as well, every key function, and pricing, etc. And the, the point of all this is when a founder comes to us with a question, we can direct them to someone who has very specific narrow expertise in the exact area that they’re looking at, whether it be a layer of the technical stack or a specific sort of functional or, or tactical decision that a company needs to make. And so we basically wanted sort of our own ultimate kitchen cabinet pre-wired the ultimate party round so that the companies themselves didn’t have to do that. It was very inefficient to do that at a, a one off basis. And so what, what were the sort of most common threads? I would say the, the very clear thread of all of this was just immense intellectual curiosity, and people who were driven by passion and excitement around the technologies in the markets themselves where money was almost a non factor. I mean, the, the amount of conversation that happened around the financial element, it was almost anecdotal at the end. It was like oh yeah, by the way, you know, there’s a, a financial mechanism to get involved if you so choose as an LP, as an investor, as an owner of the business. And they, they own about a third of the, of the partnerships. So they’re all equity partners in the firm. But, but really that was, that, that, by the time we got there, that was a actually typically a very easy conversation. The more challenging one was understanding what their passion was, what their, where they wanted to spend time, you know, and, and how they gave back to companies. And for the most part these are people who are, you know, you know, olympic athlete kind of quality and status in whatever they did. And now were really, you know, felt incredibly, you know, lucky and for where they, where they, where they are and what they’d achieved. And really their focus was to be a teacher and a sort of pass it on to the next generation. And I would say that sort of teacher mentor mentality and, and really being driven by that, and just really high quality good people, good hearts, was the, was the biggest I’d say common thread between the, the advisors that we ultimately talked to. And just always making themselves available and being deeply passionate about the technology ecosystem and, and making a positive change in the world. Nick: Must be some list! Chris: Yeah. We are, we are very, very fortunate and, and it’s, it’s, it’s, you know, a list of some of the sort of iconic founders in the Valley that you would have heard of from, you know, everyone, from names like #Jerry Yang and #Pierre Omidyar and #Stuart Butterfield and, and #Mike Olsen of #Cloudera and #Ross Mason at #MuleSoft and, and so on and so forth, to a lot of names that you might not have ever heard of but that were, you know, products and engineering leaders and luminaries within the companies that, that you know of like, you know, #Facebook, #Google, #Dropbox, #Salesforce, and many more. Nick: Awesome. So #Chris, I’ve been reading a lot lately about this, this evolution of micro VCs and how that’s impacting the ecosystem, you know. In, in light of what you’re doing at #Signal Fire and sort of a, a modern approach to, to the venture fund, what are your thoughts on the emerging micro VC movement and, and also the effect on incumbents? Chris: Yeah. I, you know, I think that the venture market has evolved a tremendous amount and the, you know, the, the larger top micro VCs, you know, the, the, the first rounds, the full lists, the data collectors, the, the forerunner ventures of the world. Yeah they’ve basically I, I guess, sort of moved into the domain that used to be the bread and butter of the classic Series A venture funds. They’re usually the first major institutional investor. They put much more resources and horsepower behind these their companies. They’re, they’re the first call that a lot of these founders make. And a lot of the venture capital firms have sort of moved upstream and they’ve become frankly much more momentum investors. And until you have metrics and, you know, science of product market fit, they’re not interested before that. And they really want to write a 7 to 10 million dollar plus check. And I think there’s nothing wrong with that, I, you know, I think they’re an important part of the ecosystem and they’re, and they’re partners of ours. And so I don’t mean it in any dismissive kind of way. But, you know, they, they, they tend to sort of specialize on accelerating your growth rather than sort of being that, that first institutional capital that they had sort of classically been going back to the 1970s. And so, you know, I think that the market has moved into sort of, and, and even the micro VCs themselves, you know, often not the first money in just with the, the number of accelerators, whether it be #StartX at #Stanford or #Y Combinator or Friends and Family Rounds or even pre-seed funds, that’s, that’s specialized in, in investing when there’s, when there may not even been more than a single individual, you know, the industry has, has specialized from there. But I, I think, you know, we consider ourselves in that sort of second group of micro VCs as opposed to folks that, that need to see sort of most of the key metrics line up before they’re willing to take a swing. But I think that, that each, you know, this is a mature industry, companies are staying private longer. And each of these players play a very important role in the life cycle of a company. And, you know, you know, while there’s a, a love hate relationship sometimes between investors and the entrepreneurial community, I think most, most, you know, entrepreneurs like their VC, they just may not like the industry. You know, and, you know, I think there’s a lot of really high quality folks out there. And it’s something that we spend a lot of time trying to sort of guide our founders to, to, to partners in these, in these companies that they can, can bring a lot more to the table than they, than they take away. Nick: Yeah. So while we’re talking about founders, what advice would you have for founders that are sort of at that point where they’re considering fund raising and, and bringing in external capital? Chris: You know, I mean, I think one thing that I, I have seen too much of is, is sort of an auction process. We guide our, our founders much more to do a “pre-raise” to go choose a handful of the, the top investors that they think can add the most value, try not to rush those relationships. It’s very much like getting married. And it’s very difficult to get divorced. Much more than so than, than, than in real life. And so why would you take any less of a rigorous process of dating than you would in, you know, your own, your own personal life. And so I think that that’s one thing that I really counsel advisors, our companies on is to really think through every person they bring on as an angel, every person they bring on an as advisor, every institution they bring in as an, as an investor. Make sure that they really vet them for culture and individual, you know, world view, their own commitment to their portfolio, reference them with other founders. And I think this is one of the, the good things frankly that, that some of the incubators bring in the sense that they sort of aggregate some of that information. But I think, you know, in, for their own self interest they often like to sort of fragment and, and have lots of individual, you know, investors come in to a company, you know, for, for fractional shares. And that doesn’t ultimately serve the companies very well because, you know, no one really has a ton of interest as sort of be there when, you know, when times are tough because they, you know, it’s so fragmented. And so, you know, I think finding the right people who are really niche driven, who are, are believers and passionate about a space and a solution and a problem, you know. All those things are, are, are more important than optimizing a round, you know, a few million dollars of difference in pre or post money valuation. And I think, you know, it’s, it’s very easy to lose sight of that, particularly in the early stages of a company. I think that’s, that’s something that we spend a lot of time on and that you can, you know, as a founder, as tempting as it is to spend time, you know, on, on some elements of your business that are, are really pressing for a product or engineering perspective, you, you really need to focus on, on team building and culture and the set of advisors and influencers that you bring in, you know, every step along the way and that you can’t cut corners there. It’s just too important to get right. Nick: If we could address any topic here on the program, what topic do you think should be addressed and who would you like to hear speak about it? Chris: You know, I think one of the most pressing topics in the technology industry as, as evidenced by the geopolitical situation around the world with everything from Brexit to our own political elections and what not is that the technology industry tends to live in a bubble. It’s one of the things that we’re trying to sort of join obviously as sort of the, the industry perspective from all around the country of what if you could architect from, you know, sort of from a clean slate, you know, what, what would you do, which, which, you know, is, is a huge opportunity as a startup and the advantage that they have. But it also can be hugely disruptive, is a term we so commonly use in the Valley, to other industries. And I, I, I think understanding the impacts of some of the decisions that we make as an industry and how that affects other parts of the country, how it, that affects industry incumbents and how, you know, I think that’s the barrier to a lot of adoption of some of these technologies, of these business models. And one of the reasons it can be so pulverizing as well. We may create jobs and be very proud of that as an industry and it is something to be proud of. At the same time, we’re probably net job destroyers, you know, in, in some circumstances as well, where, you know, jobs that were done, you know, manually for many years will now be automated through AI, robotics, you know, and various forms of automation of labor. And I, I think there’s tremendous opportunity and it’s also something that’s a force that you can’t bottle, even if you tried to put your head in the sand, it will be down in other parts of the world. And so I think it’s a fool’s errand to try and sort of stop, you know, history from happening and evolution. But that, that said, I think, you know, being part of a, of a broader solution outside of the four walls of your company is a, is a key theme and topic that we in the industry need to be thinking about and cognizant of. And it should affect the way that we think about creating the technologies that we, we think about partnerships with, with other constituents in the industry. And in the way that we message the value proposition of what we’re doing because we’re often very myopic and self serving, and the way that we look at that in the short run. And I think it doesn’t, it doesn’t do anyone favors in the long run. Nick: #Chris, what startup investor has inspired and influenced you most and why? Chris: Startup investor who has influenced me, I mean, I’d say probably the, the person that I’ve worked with at, you know, the, I’ve, I’ve had the, the, the, the privilege of working with many great partners and whether it was #Ron Elwell who was my original mentor at #Bessemer Venture Partners, who’s no longer in the venture industry but is, is running a startup, to, to partners, you know, like #Hemant Taneja at #General Catalyst who I worked with closely on, and #Neil Sequeira, on launching the California office for, for #General Catalyst. And then, you know, more recently, you know, my partners, you know, #Ilya Kirnos who’s, who’s also our CTO and who comes from a very sort of distinctly, you know, engineering technology perspective, and, and #Walter Kortschak who has just an unbelievably storied career running it from #Summit Partners and has been just a fantastic mentor and partner in, in sort of really thinking through how to build a firm. To more recently, you know, my partners, you know, #Mike Mangini on the, on the talent side #Mark Jacobson and, and #Yujin Chung on the, on the market development side. And then more recently #Tony Huie who joined the team. I, I, every day I, I feel super privileged to get to work with such an amazing group of folks. And, and this is very much an apprentice industry. And it’s very much one where you need to look at things from many different perspectives. And I, and I truly believe you need conviction and you, you need to, you need to allow controversy but you also need to have many different perspectives on a problem and, you know, that’s one of the best parts of, of venture capital is this collaborative nature either within a firm or, or outside of the four walls of the firm. And I’ve had the, the great pleasure of working with many, many top VCs in the industry. Nick: And, and just to finish up, what’s the best way for listeners to connect with you? Chris: The best way they, to connect with us is, is, you know, almost always to, you know, come in through someone in our network that you know, whether that be one of our founders, one of our advisors. We have a very broad and deep network. It’s pretty easy to figure out from, you know, #AngelList or various places. Our website doesn’t have anything on it. And so, you know, that’s not to say that, that people can’t approach us cold but it’s, it’s often helpful to, to come on, come in through someone who has a perspective on you. And we have such a broad net that that it’s often not difficult for a founder to do. But you can always, you know, email me directly at chris@signalfire.com . But, but usually best from an expedited standpoint to, to come in with a little bit of context from, from someone who, who has seen you and knows you from, you know, a prior job or a prior startup or, or school or whatever it may be. Nick: Awesome! Well, #Chris, I, I love to bring people on the program that are, are doing really unique things and, and creating new value and taking that modern approach to venture. So clearly you’ve done that and I really appreciate you taking the time to, to speak with us today. Chris: Alright, thanks so much #Nick! Really appreciate you having me on. Great show that you guys put together and, and a pleasure to be on it.